This is a tale of swashbuckling derring-do and challenges aplenty for one of the most famous kings in history. Battles galore and travels through war-torn regions dominate Leon Mintz’s Arise Pendragon, a novel that provides insight into the great King Arthur behind the myth. The second installment of Mintz’s Arthurian Tales series, this is a story of Merlin’s attempts to protect teenage Arthur, called Artorius throughout this volume, after his father is killed. Set in fifth-century Europe, as the Roman Empire is continuously attacked by barbarians, the book finds Merlinus fleeing with young Artorius. Both assume new identities to keep the king-to-be safe. Merlin is still reeling from the death of Arthur’s uncle, Ambrosius, another person under his protection, and the care of Arthur weighs heavily on his heart and mind. Early in the adventure, Arthur first encounters the nymphish Guinevere, the woman who will one day be his queen. Though the encounter is short, it leaves a lasting impression on Artorius, and he pines for the beautiful Guinevere throughout the rest of his journey. Chapters detail encounters with different groups of soldiers during Merlinus and Artorius’s five-year quest, one that ultimately leads them back home. Fight scenes abound, and Artorius’s chivalry, charisma, and character shine through more brightly with each confrontation. The chaos that surrounds the men is vividly drawn, and tension rarely lets up, even after battles are won. Such scenes do become repetitive, however. Emotion and character development don’t come into the picture very often, and Artorius is the only character who feels fully fleshed out. Merlin seems weary and resigned throughout, and the rest of the characters are so plentiful (and their names so similar) that they’re nearly impossible to keep straight. Arthur and Merlin traverse much of fifth-century Europe in their adventures, though settings are not described in great detail. Battle-wracked villages, ports, and castles are briefly mentioned to set the tone for the inevitable battle sequences, but more atmospheric illustrations would have been beneficial. Stories of Arthur as a teenager aren’t plentiful, and Arise Pendragon blazes a new trail in that area that fits in well with other Arthurian chronicles. It fills in holes from Arthur’s past, and first encounters with both Guinevere and the fabled Excalibur provide bursts of excitement that help the action along. 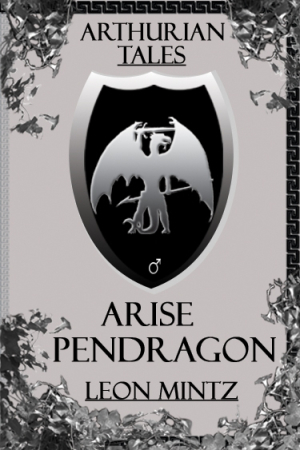 A tale of swashbuckling derring-do and challenges aplenty for one of the most famous kings in history, Arise Pendragon is an action-driven tale that will be of particular interest to Arthurian aficionados.